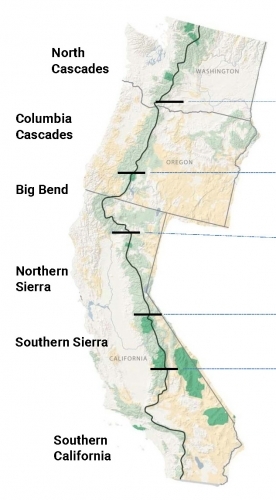 Managing a 2650-mile trail is an immense task. PCTA’s “boots on the ground” for executing our mission are our Regional Representatives. Each office takes the lead on approximately five hundred miles of trail. They work closely with local networks of seasonal staff, volunteers and partners to oversee the maintenance, management, and protection of their region. If that sounds like a lot of work, it is! They attend countless meetings, respond to trail protection issues and coordinate projects on their section of trail. PCTA’s Regional Representatives are extremely knowledgeable about the PCT. The next time you cross paths, please stop and say hello! If you would like to meet at one of the offices, please call to set up a rendezvous. Please read the “Our work” section of our website for a more complete picture of what our ‘Regional Reps’ do on a day to day basis.